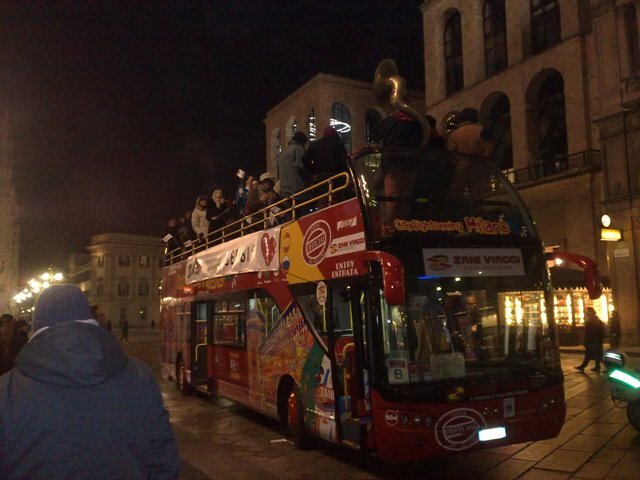 There are many great things about living in Milan, not least of which is that once a year Serbia’s tourism board rents a double-decker bus, gets a band to play traditional Serbian music and then sends the pair on their way picking up people as they go. 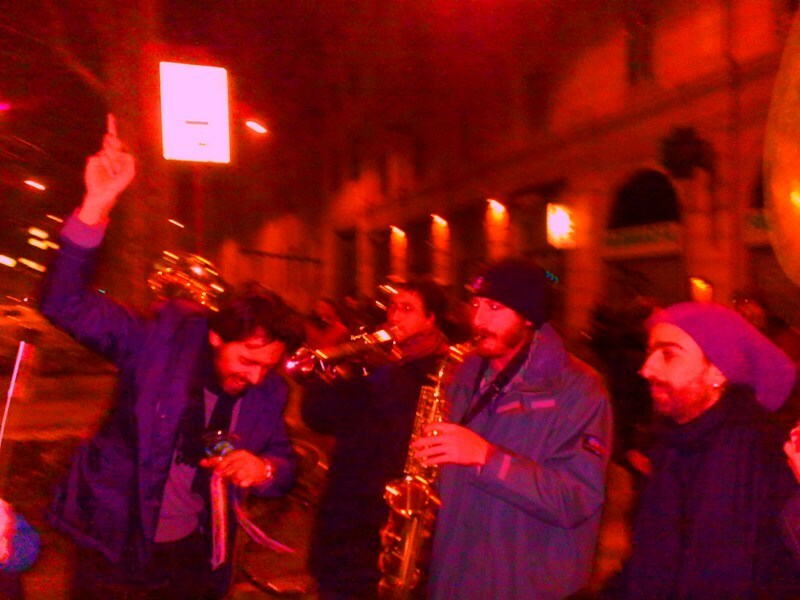 And so it was that Friday night I found myself on the upper level of a red tour bus cruising the streets of Milan listening to phenomenally engaging trumpets, saxophones, tubas and a drummer. The Serbs time these tours to coincide with the Borsa Internazionale del Turismo – BIT, Milan’s massive trade fair dedicated to the tourism industry. The band is called Nema Problema, “no problem” in English, and I’m told they do weddings. Too late for me, but if you are still in time I think these guys will make your party one to remember. A tip if next year you find yourself on this bus: before gulping down the clear liquid you’re likely to be offered in a plastic cup at some point during your ride through town, that would be the liquid that seems to be making everybody happier, make sure you ask what it is because it’s probably not water. What joy. 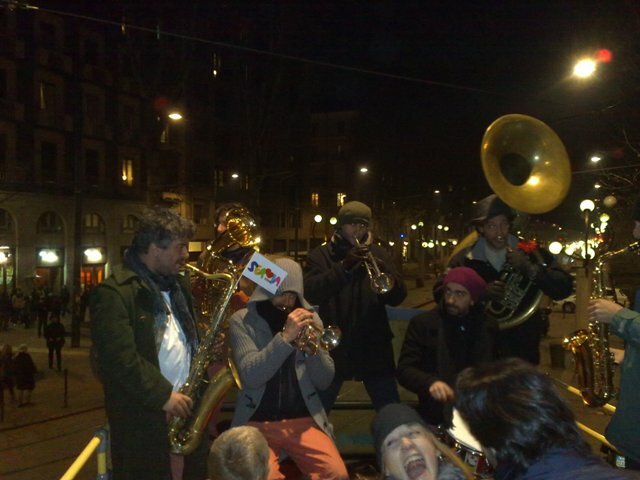 A Serbian brass band u Milanu! Nema problem is a phrase that everyone in the ex-Yugoslavia uses to ward off bad vibes and it will be the first or second phrase you ever learn if you travel there. Learning many more phrases will be facilitated by consuming more of that clear liquid, which is called rakija and which is a close cousin to grappa. (In Serbia it’s often made of plums or slivi and called slivovica. Down south where it’s hotter the grape variety is more common.) Ok, I’m going to go put on a good Kocani Orkestar song now, or maybe the Gypsy Beats and Balkan Bangers CD of Balkanic remixes I picked up. Now that’s affordable art. I think I’ll have to get the Regione Puglia to organise a bus that tours Milan during the BIT fair with some pizzica musicians/dancers on it! We are going to get Provincia di Porto Tolle, to fund a tour with live eels, polenta, and shellfish. Of course Porto Tolle is not a provinca yet, but that will change as soon as Veneto statehood comes about. @Hank, I’ll be the first to sign up for the eel + polenta + shellfish tour out in Porto Tolle. On the whole I’d have to say I’m against Veneto statehood, but if that’ what it takes to get that tour started then I think I could be convinced. And thanks on “Nema Problema”, didn’t know that about the warding off the bad vibes. I’ll give that a go and let you know if it works. @Vale, pizzica on a bus, now that is something to look forward to. If you can get that organized I promise to dance the pizzica on that bus, and that would be a sight not to be missed. Well, Veneto statehood would really make Italy uncomfortably like the country that used to be Yugoslavia, so we can let that go for now. But other than the southeastern United States I can’t think of a place that does the real coastal cucina povera — corn products and sea creatures — quite as tastily. I’ll take my grits and shrimp Polesine-style or Charleston-style, they’re both great. Now… do the coastal ex-Yugo people make this dish, too, one wonders? Kacamak is Balkan polenta but is usually eaten with pork or peppers. I think the only time it’s used with fish is as bait. Eric, this merits a fact finding trip. How about a pilgrimage to Manastir Ostrog? It’s lunch time and I’m starving. I ate so much meat in the Balkans I’m fascinated by the idea of Balkan seafood. After all it’s a peninsula too. The Croats cook up a fish stew called brudet (try googling with od morskih riba which means seafood) that they eat with polenta. Now I’ll move on to the East coast — Bulgarian and Romanian fish stews must be interesting. Somewhat disappointingly, it looks like ‘brudet’ is very similar (like a lot of Dalmatian recipes) to the brodetti marchigiani. Drat. But moving further to the east, we get the promise of not only fiery fish stew (that gave its name to one of Yugoslavia’s most well-loved rock bands) but also, intriguingly, fish pies. I’ve had ‘zelnik’ before but usually stuffed with nettles up in the Osogovo mountains. A fish version — like a Balkan stargazey pie — is deeply intriguing. It is definitely time for lunch. I’m down for the food fact-finding tour…sounds absolutely wonderful. Just tell me when we are leaving. And after all this, a miserable plate of spaghetti with a few sad tomatoes and some shrimp remnants that I had to salt liberally to get to taste like anything. Maybe I can experiment at home tonight. Train to Ancona, ferry to Split, sail to Dubrovnik, then bus to Montenegro border and Herceg-Novi, then another bus to Budva (that will have to be loaded onto a ferry to cross the Bay of Kotor), then we’ll work our way south to Ulcinj. Maybe get in some whitewater rafting on the way back north or bus it over to Nis (will take a long time if they still don’t go through Kosovo) to see the famed Tower of Skulls. Plus a side trip to Leskovac for the famous “Leskovacki rak” — Leskovac crab, which is not actually seafood but a massive, crab-shaped concoction of grilled meats and cheeses. Then bus to Skopje, train to Thessaloniki for baked octopus and cheese and ouzo and we’ll work out some ferries back to the Boot. okay, so now you have me wishing I was unemployed (and wealthy) so we could leave tomorrow.